Walnut oil is obtained by cold pressing of walnut kernels following by fine filtration, which guarantees their high quality and healthy effect. It is rich in vitamin A and E, which have a favorable effect on eye-sight. It contains essential fatty acids which can not be synthesized in the human body and they are imported by food and have important role in fat metabolism. These acids improve nutritional value of eaten foods. 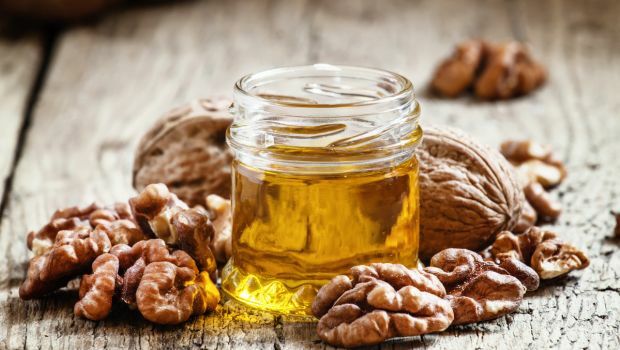 Huge containing of unsaturated fatty acids is one of the most important advantages of walnut oil, as it proved that these acids prevent advent and development of atherosclerosis. It is good antioxidant. It sustains the normal function of the organism, delays aging and prevents from atherosclerosis and cardio vascular diseases. Taking of three table spoons of walnut oil has anhelminthic action. It is delicatessen oil for salads, soups, fishes, meat and sauces for all kind of paste. The plant apricot kernel oil is produced by cold pressing. It contains naturally high amounts of vitamins from A, E and B group, being an important bio-stimulator for various physiological and biochemical processes in the body. 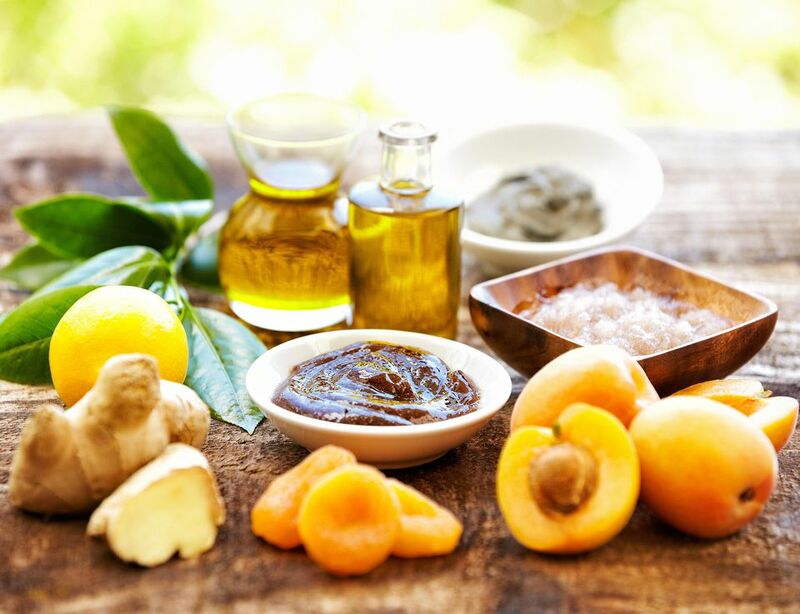 The apricot oil is a rich source of essential fatty acids Omega 6 and Omega 9 and is used for cosmetic and medicinal purposes. Beneficial for skin, hair and nails. Acting moisturizing and regenerating for dry, flaky and aging skin. Nourishes and moisturizes the skin, accelerates cell metabolism and contributes to the formation of skin collagen. Apricot kernel oil is a powerful stimulator of hair, nourishes the elasticity and appearance of hair. It is suitable as a base oil for skin and hair cosmetic masks and tonic for body massage, improving circulation, stimulating the natural life functions. It is well accepted by skin, absorbs in depth and gives velvety softness. Taken internally (one to three teaspoons – tree times a day) acts strengthening, increases the appetite and helps for treating digestive problems. 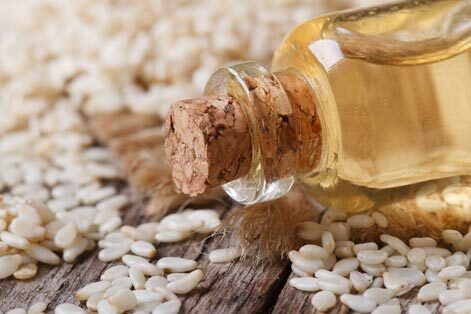 Sesame seed oil is known for 5000 years in Far East and since then it is used for medical and cosmetic aims. It delays aging of cells. It has wonderful effect to dry, wrinkled, aging and peeling skin. In external use and massaging sesame seed oil may notable improve skin’s look. It helps wound healing of burns and other skin irritations. Oil of sesame seeds may be used for making herbs infusions or like vehicle of essential oils. It is the perfect massage oil. By reason of contain of lecithin it helps to brain cells. It is recommended against depression and tiredness. It is simple and efficient remedy against insomnia, applied like feet and legs massage before sleep. Outwardly, in the form of nasal drops, it has soothing and draining properties in cold with hard and scanty secretions and dry catarrh of the nose. Sesame oil is one of the few natural products that can absorb ultraviolet rays, and therefore is widely used in the sunscreen cosmetics. It has a natural SPF 4. Contains vitamin E, lecithin, methionine, minerals, potassium, magnesium and phosphorus. Due to its high antioxidant properties it has a very long shelf life. It is reaches in Omega 3 and Omega 6 unsaturated fatty acids. It contains vitamins A, E, B complex, Zinc, Celina and etc. which have a favorable effect on human body. Infiltrate deeply in skin’s poles, protect skin against aging, makes it soft and smooth. For internal use /2-3 tea spoons 3 times a day/ it stimulates digestion. It has excellent effect to urinate disturbance, prostate disease, infections in secretor system. Dietary, healthy and delicacy oil for direct use as an addition to salads, sauces and other dishes! Flaxseed is known as a healing herb since ancient times. First cultivated in Europe, the plant’s brown seeds were regularly used to prepare balms for inflamed skin and healing slurries for constipation. Today, flaxseeds (also called linseeds) are best known for the therapeutic oil that is derived by pressing them. Flaxseed oil is an excellent source of essential fatty acids Omega 3 – about 58% and Omega 6 – about 14%, which is necessary for good health. These acids can not be synthesized in the human body and must be obtained through food. They support the function of the cardiovascular system and the immune system, nervous system and last but not least take part in the reproduction. The regular consumption of flaxseed oil / 2-3 tablespoons daily / reduces the risk of cancer and protects against the effects of aging. It has a beneficial effect on symptoms of menopause and menstrual cramps. 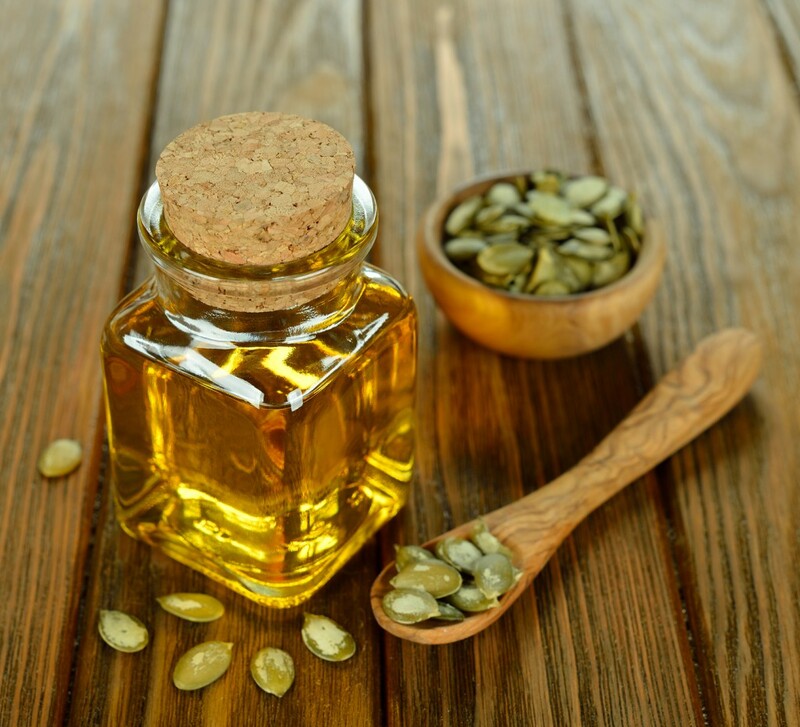 The consumption of flaxseed oil improves the condition of skin, hair and nails. 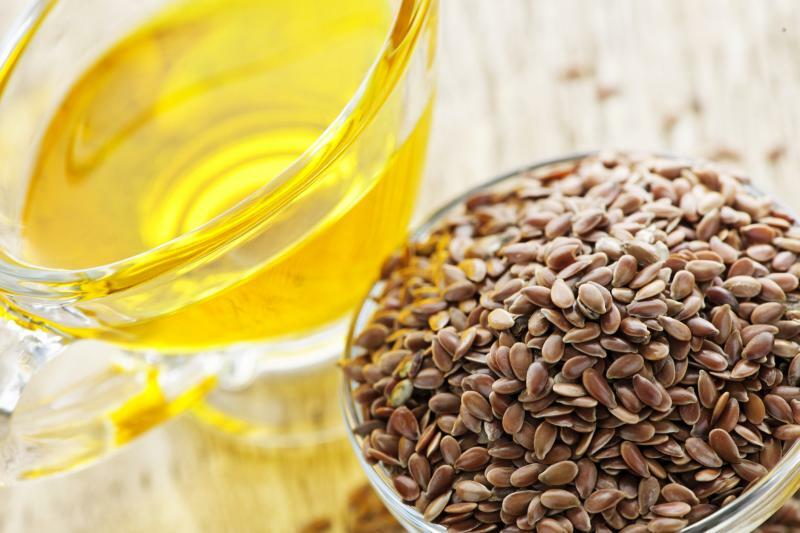 Flaxseed oil contains a significant amount of plant hormones – lignans. Lignans are important herbal ingredients that act like hormones in our body. They have the ability to connect with existing hormones and maintain their optimal levels required for our good health. Flaxseed oil can be taken pure, but may be mixed with honey, fruit or syrup. 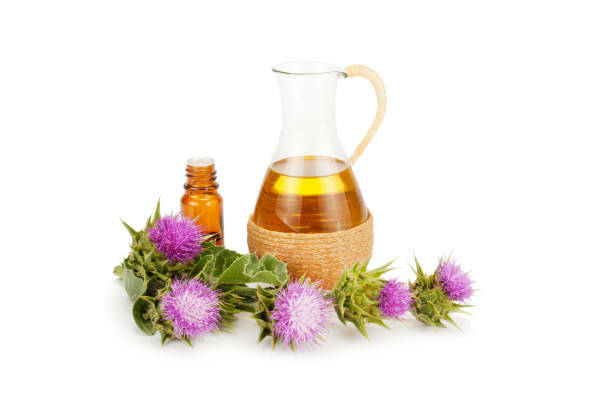 Milk thistle oil is a natural product and rich natural source of vitamins (A, D, E, F, etc. ), minerals and trace elements (copper, zinc, selenium, iodine, boron, etc.). Cold pressed oil from milk thistle is extracted from the thistle seeds / Silybum marianum / and is rich in silymarin – the only substance which is believed can liven the liver cells and regenerate the gallbladder cells. The oil has an extremely high content of needed for the body unsaturated fatty acids. The product is rich in biologically active substances with beneficial, stimulating and stabilizing effect on the immune and nervous system. The benefits of cold-pressed oil of milk thistle are that it protects and improves the blood circulation by helping the liver to discharge toxins from the blood and supports the easy flow of blood through the body. Known and used since ancient times, the almond oil is one of the most powerful natural stimulant for the hair growth and strengthening. It nourishes its roots, stimulates growth, shine and elasticity. Almond oil is a classic skin oil – it penetrates very well and is suitable for all skin types and all ages. 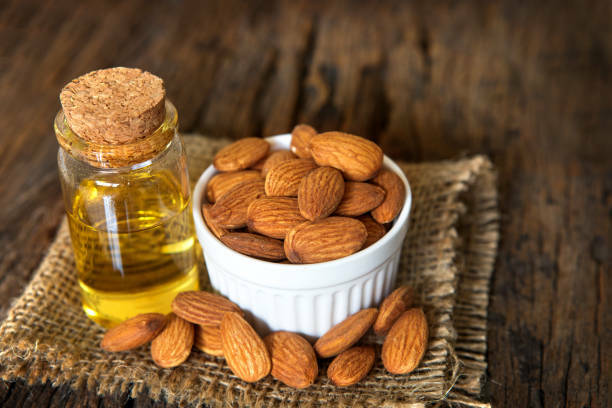 Almond oil is a rich source of essential fatty acids / oleic and linoleic / and vitamin E. Its composition is closest to the human and because of its good effect it is called “skin” oil. It is most commonly used in cosmetics and as a base oil in the aromatherapy. It quickly absorbs, soothes, softens and smoothes the skin, rejuvenates and protects it. Not accidentally since ancient times it is used as a massage oil for babies and children. It has many good effects on dry, sensitive, aging and rough skin. It is not irritating and does not cause allergic reactions and is suitable for body massage. It may be advantageously combined with a variety of drugs and herbs. Taken internally (6-7 drops to a teaspoon three times a day, 20-30 minutes before meals) it has a soothing effect on gastritis, ulcers and some minor stomach disorders. It regulates the gastrointestinal function and has anti-inflammatory and expectorating effect. Grapeseed oil is a gift from the core for the heart. Produced by cold pressing of red grape seeeds and subsequent fine filtration. Grape seeds are an important source of one of the most powerful natural antioxidants – proanthocyanidins. Proantotsiandite have many times more powerful antioxidant effect than vitamins C and E (20 times stronger than vitamin C and 50 times stronger than vitamin E). At extremely high concentrations they are found in the seeds of red grapes. Recommended is the intake of extracts derived from grape seed, because in them the concentration of proanthocyanidins is significantly greater. Studies have shown that these antioxidants have a strong anti-inflammatory effect, anti-allergic properties and counteract the free radicals. They reduce the level of bad cholesterol in the blood, help for normalization of blood pressure, protect against atherosclerosis and improve the nervous and immune system. From ancient times the oil produced from cold-pressed grape seeds has been known as a miraculous medicine for the skin. It consists of 70% essential fatty acids, which are readily acceptable by the skin, combining and retaining its moisture. It has the ability to regulate the oiling and is among the few oils suitable for oily and combined skin. Tightens but does not close the pores! It helps the skin rapid recovery, which makes it suitable for use in wounds, burns, abrasions. The grape seed oil improves elasticity of tissues, restores collagen and improves the peripheral circulation. It effectively restores the eye area in the fight against acne, stretch marks and cellulite. The grape oil is a preferred ingredient in many cosmetic products for the treatment of damaged tissues under stress as it has regenerating and restructuring properties that allow maintaining the natural moisture balance of the skin. It is used in various SPA-treatment procedures and massages. 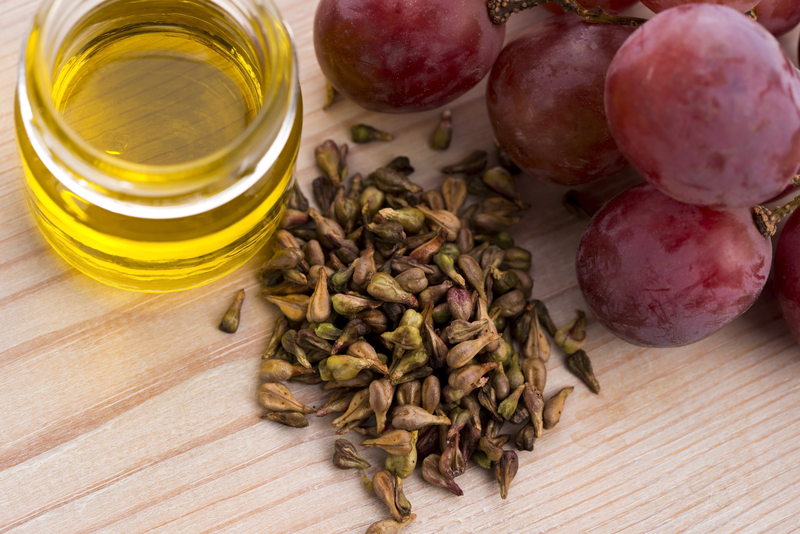 The grapeseed oil has the highest temperature boiling point (216°C/420°F) among the cold pressed oils. This makes it an excellent and healthy alternative to cooking at high temperatures. Its intense flavor brings a special touch to each dish. Nigella is called the seeds of the one-year flowering plant from the Ranunculaceae family, originating from the Southwest Asia region. 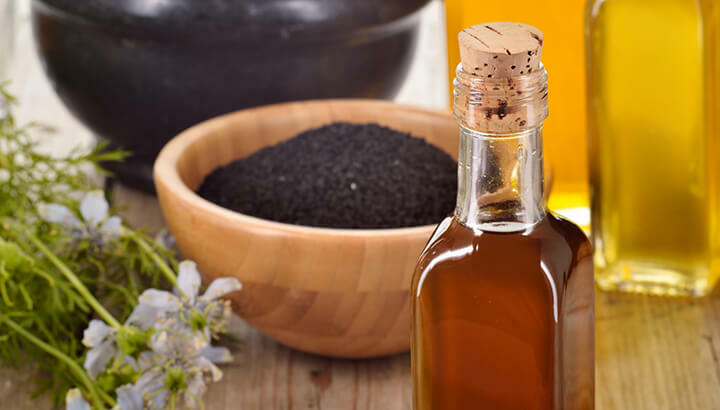 The botanical name of the black seed is Nigella Sativa, and its seeds and their oil can meet also under the names of black seed, Polish chelebitka, Roman coriander, and Pharaonic oil. Its popular name is “black cumin”. The Nigella seeds contain 15 amino acids, including eight of the nine essential carbohydrates, fatty acids, volatile oils, alkaloids and fibers. To its composition we can add minerals like calcium, iron, copper, phosphorus and vitamins B1, B2, B3, B9. Nigella is used for treating asthma and bronchial problems, rheumatism, diabetes, diarrhea, cough, colds, flu, nasal congestion, headache, hypertension, memory improvement, muscle pain, relief of nervous tension, impotence and the like.